The U.S. women's soccer team celebrates its World Cup victory with a ticker tape parade followed by a Key to the City ceremony from City Hall's Mayor Bill de Blasio in New York City. NYPD helicopters fly over Citi Field at the opening day ceremony for the New York Mets. The fly over honored 10 members of the NYPD and FDNY that have been injured in the line of duty. A team member from the All Cats and Dogs Team slips and falls from the top of the muddy wall and lands in the muddy water below during the Bowling Green Mud Gauntlet at Phil Moore Park. The gauntlet was presented by the Family Enrichment Center in their efforts to prevent child abuse. Michael Russell serves to Richard Gasquet during the mens singles first round at the U.S. Open tennis tournament held at Arthur Ashe Stadium in Queens, Ny. Russell lost to Gasquet 6-3, 6-4, 6-2 and at 35 years old Russell plans to retire from tennis later this year. "I’m actually really happy about this. I can retire on my own terms," said Russell. University of North Texas Silvester Harrison collapses onto the ground after finishing the mens 8K run at the Sun Belt Cross Country Championships held at Kereiakes Park in Bowling Green, KY. Harrison finished 21st to help his team finish first place in the competiton. Western Kentucky University Sophomore wide receiver, Willie McNeal, juggles the ball in the end zone before making the catch over Louisana-Monroe Sophomore cornerback, Rob'Donovan Lewis, for a touchdown giving WKU a 7-0 lead in the first quarter at Smith's Stadium in Bowling Green, Ky. Western Kentucky University lost 43-42 in overtime. Coy Hooten of Huntington, Tennessee prepares a bull for the Bull riding competition at the Kentucky High School Rodeo, which was held at the WKU AG Expo Center. "I just hope I can stay on long enough to qualify," said Coy. Cross Country runners begin the 8K run at the 2012 Sun Belt Cross Country Championships held at Kereiakes Park in Bowling Green, KY. University of Arkansas-Little Rock finished the race with the least amount of points (58) placing first in the competition. Horse Jockey Ivan Cruz exits the Keenland race course after finishing 7th overall while riding Uncle Ted October 10, 2012 at Keenland in Lexington, Ky. This is Ivan's first year of racing with 14 first places, 19 second places, and 25 third places with 202 starts all together. Bikers turn a corner of the Tour De Georgia bike race in Gainesville, GA.
Na Li signs tennis balls after beating Olga Govortsova 6-2, 6-2. in the women singles first round at the U.S. Open tennis tournament held at Arthur Ashe Stadium in Queens, Ny. 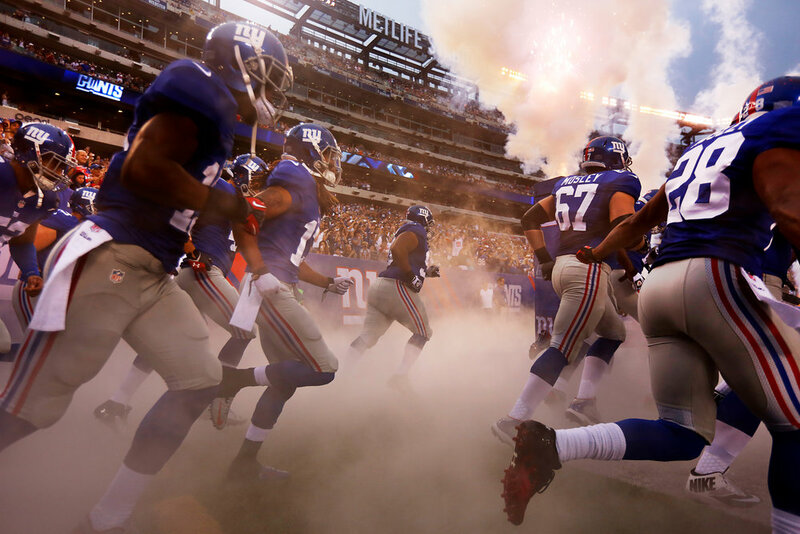 New York Giants enter the field for their NFL football game against the Indianapolis Colts at MetLife Stadium. Serena Williams returns to Galina Voskoboeva during the women singles second round at the U.S. Open tennis tournament held at Arthur Ashe Stadium in Queens, Ny. 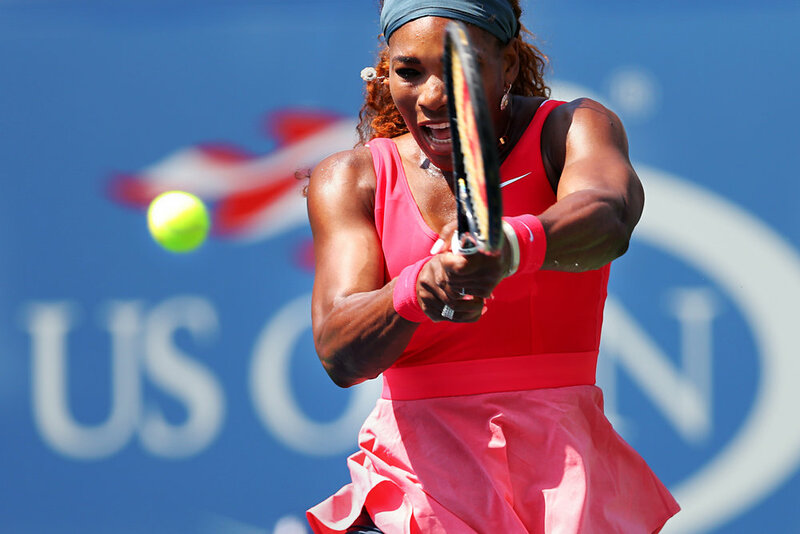 Williams defeated Voskoboeva 6-3, 6-0.